Click here for the manual ! The repair of the LAICA mosaic was successful! The broken CCD and window were replaced. The new CCD is working well. We have now included an exposure time calculator in the manual. LAICA installed at the prime focus is shown here. 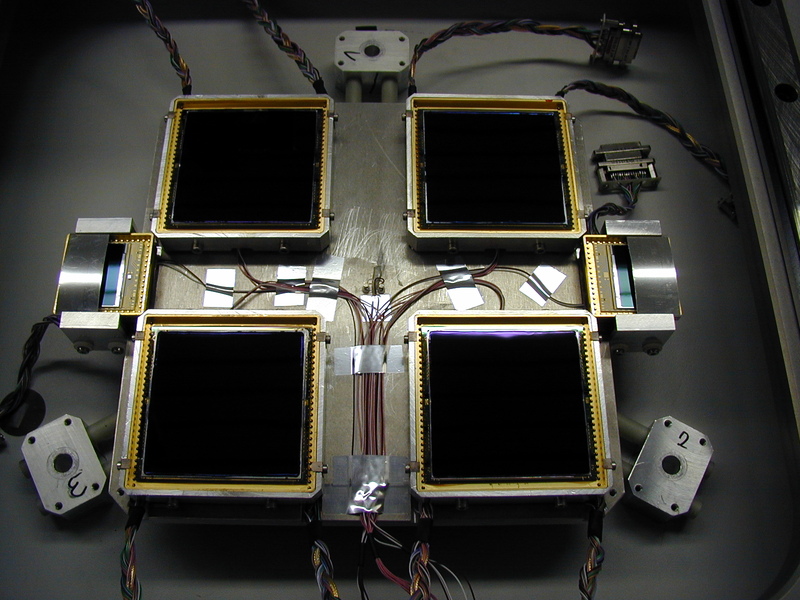 The instrument is made up of 3 parts: the CCD array, a filter module and a shutter. LAICA uses 4 CCDs with 4096*4096 pixels each with a pixelsize of 15 microns manufactured by BAE systems (formerly Lockheed Martin). Since these CCDs are not buttable, we have chosen an arrangement as shown here; the dimensions in arcseconds are given here The spacing between the CCDs is equal to the size of a single CCD minus an overlap of about 100 arcsecs which may serve for astrometric and photometric calibration purposes. A single exposure thus will not yield a contiguous field, which is probably not required for many applications. If a contiguous field is required, a series of 4 exposures has to be taken to fill the gaps between the CCDs. Click here for an illustration. The advantage of this arrangement is that it makes full use of the sensitive area: the filling factor is 100%. A further advantage is that 4 single small filters can be used (instead of a single large one) which are much easier available and cheaper. The main disadvantage of this arrangement is enhancement of image distortion effects; image degradation in the corners of the field should be minimal due to the high optical quality of the corrector optics. 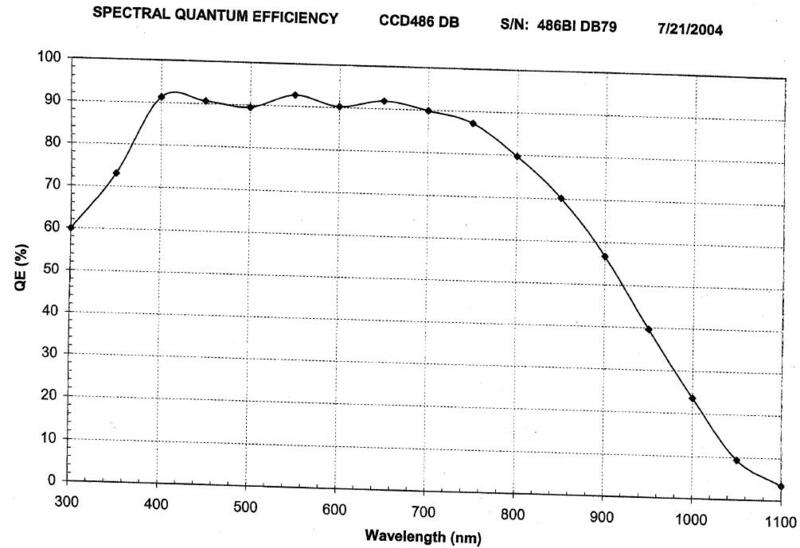 high quantum efficiency. 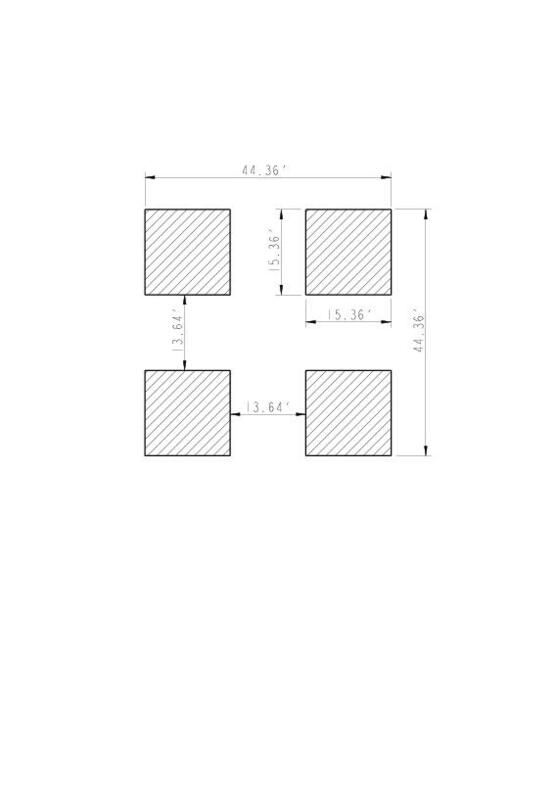 Find here the curves for the detectors M1, M2, M3 and M4. 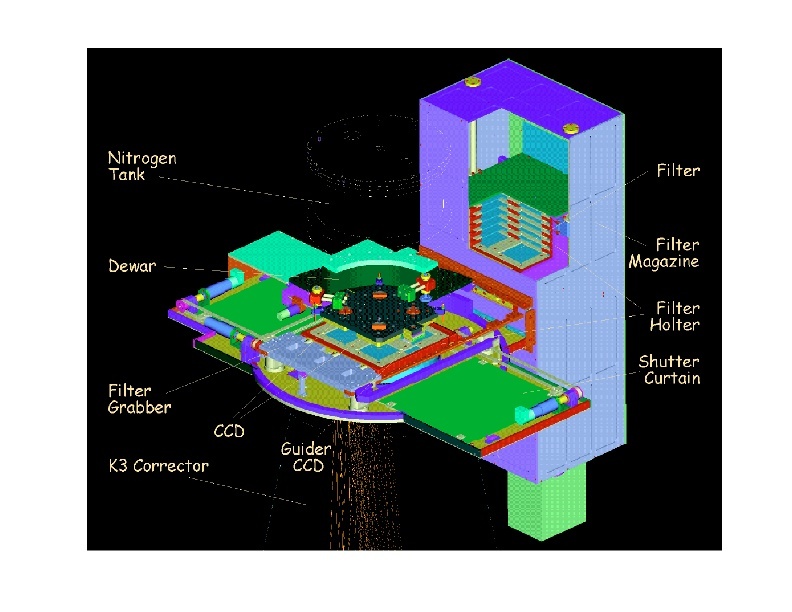 The filter module is similar to a slide projector: each set of 6 filters (4 for the science CCDs plus 2 for the guider CCDs) is mounted in a filter holder; 20 filter holders can be stored in the magazine. The selected filter is moved from the magazine into the beam by a grabber. Two filter sets will be available after commissioning, one standard UBVRI set plus an additional broad B, and another similar to the SDSS filters. 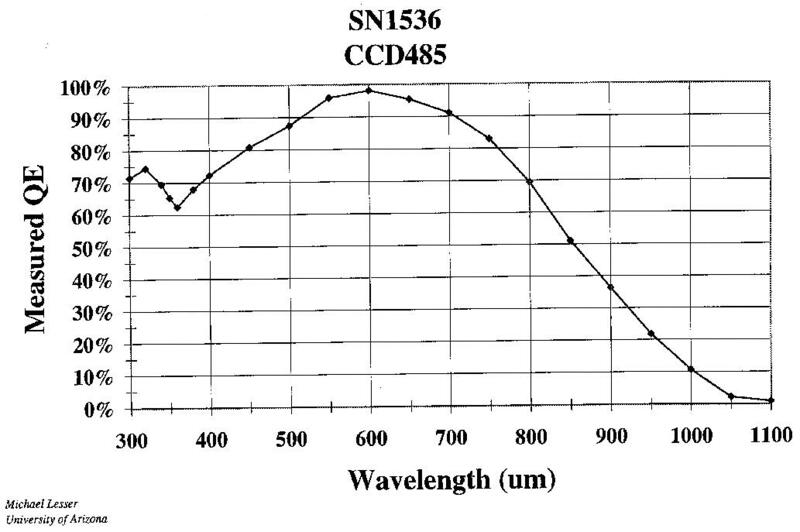 Click for transmission curves of Johnson and SDSS filters. 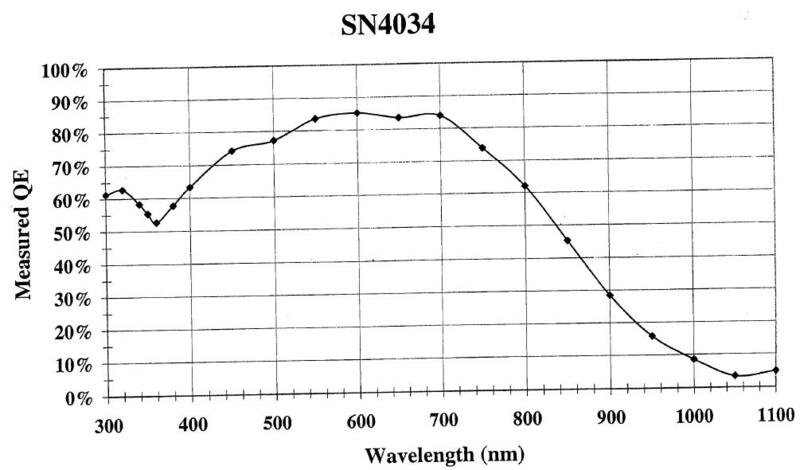 Tests have shown that inhomogeneities due to the shutter at exposure times as short as 0.5 second are less than 0.1 % over the whole field. This allows to take sky-flats shortly after sunset/before sunrise. 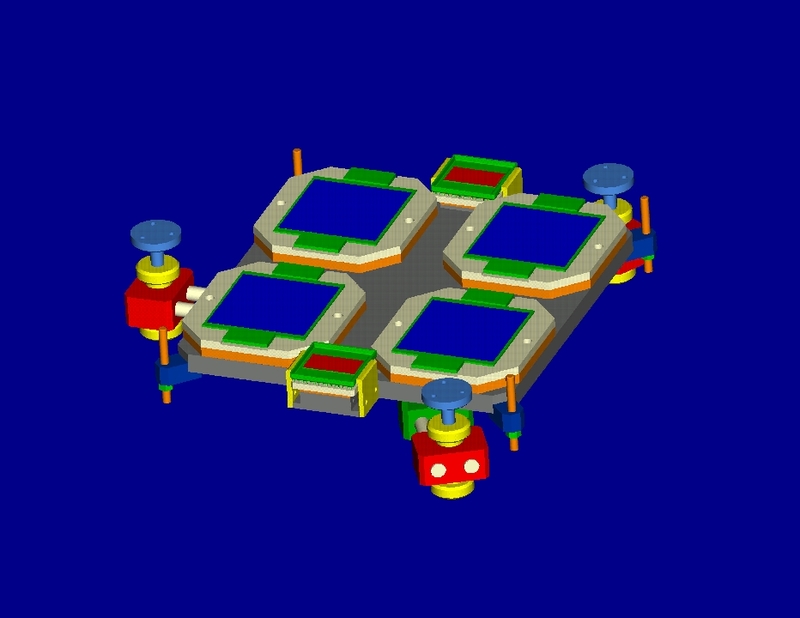 The CCD layout also shows 2 smaller CCDs which are used for guiding. These CCDs are operated in the frame transfer mode, so there is no special shutter required for the guider CCDs. LAICA has been tested - for the first time with all CCDs working properly - on the telescope from October 2003, 24 to 27. Clouds prevented tests with star light. 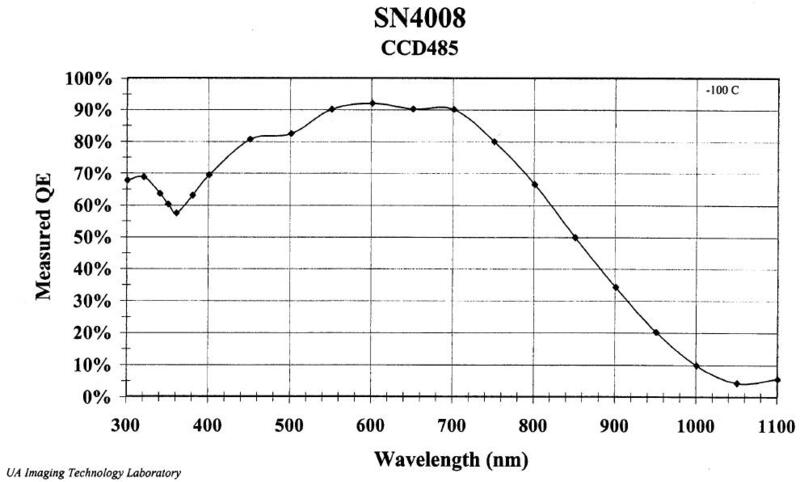 The CCD array looks very good, tests of linearity, dark current, shutter homogeneity etc all gave excellent results. LAICA has been used in december 2003, and worked very well, including the auto guider. 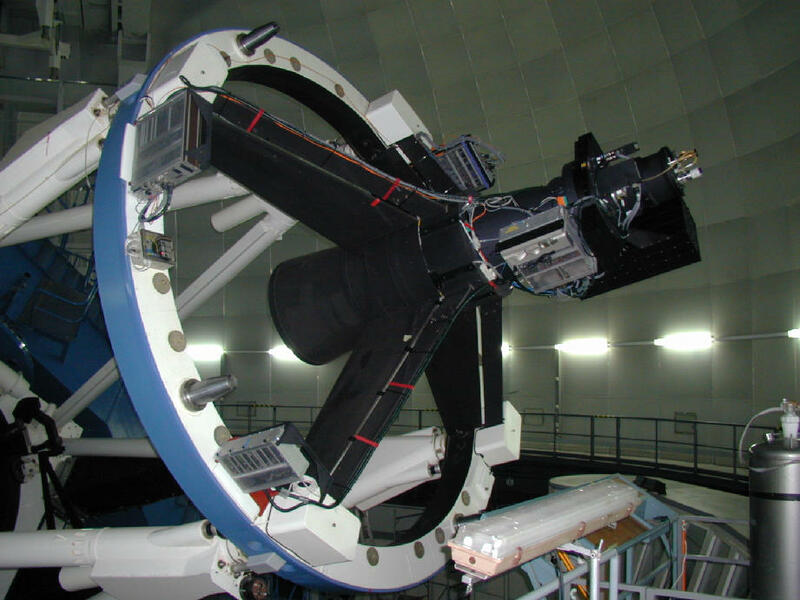 The Coma has been removed by alignment of the main telescope mirror. Until summer, we will prepare timings for fast read out, as well as a special timing for low blooming. We will also improve the cooling system. Note: LAICA is neither LAIKA nor Leica! Comments of a theoretician: Projects like this one always get delayed. But it does not matter anyway.